Why should you hire an Electrical Contractor for your electrical needs? Quite simply, it’s the only way to get your work legally and safely done by an outside party. The mandate of the Electrical Safety Authority (ESA) is to ensure that all electrical work done in Ontario meets the Code requirements of the Ontario Safety Electrical Code. Every electrical job you have done in your home or place of business requires a permit from – and inspection by – the ESA, so your best bet is to go with a licensed Electrical Contractor. The ESA has high standards for who can become an Electrical Contractor, so part of your homework is done for you, but do ask as many questions as you can think of and research carefully whomever you hire to come into your home or business. 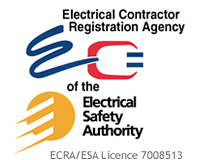 Storm Electric is proud to be a licensed Electrical Contractor with the ESA.